Awake at 6:30 a.m. and at Assembly Hall by 7, I was ready to wait in line for the IU-Michigan State basketball game. I was lucky enough to be given General Admission seating, meaning that I get a seat in the stadium’s student section based upon the time of my arrival. Once I reached the Southeast entrance of the stadium, I was roughly the 250th person in line, meaning I could probably get a seat within the first five rows (spoiler alert: I didn’t). I looked around at the other people waiting in line. They had blankets, chairs and food. I had….nothing, but was fortunate enough to be sitting next to some kind people with a propane-fueled heater. I was cold, my face was numb, and my legs are still trembling as I type. No matter how cold I was, though, I can assure all current/prospective students this: Waiting outside Assembly Hall for four hours is a worthwhile experience. Seriously, everyone should try it once (but let’s be honest, you always want the best seats possible). It is without a doubt one of the greatest (if not the greatest) aspects of college culture and brings thousands of students together. Unfortunately, my being unprepared led to me getting cold and realizing I had four-plus hours of waiting. That being said, I did the only thing I could do in a time of need: tweet. I started out fine, but then got progressively colder as the Sun started to rise. Using the heater to my advantage for half of a minute. For those unaware, diamonds are the infamous “Illuminati” symbol that Jay-Z uses. And when I thought things could not get better during my wait, I saw ANOTHER camera approach me, this time with a reporter! The reporter was from ESPN Campus Connection and asked if I would answer a few questions for their segment on Indiana. I felt obligated, even though I probably wasn’t looking my best. Of the two questions I was asked, I remember using the word “fortunate” three-too-many times (it was cold, give me a break). Anyways, my friend–who I decided to save a seat for–finally arrived with food and drinks for me and joined me in line (I’m obviously the better friend for saving the spot, but whatever). We ended up getting our seats in the tenth row, which was absoultely awesome. The crowd was passionate for two-and-a-half hours, screaming, chanting, wearing sunglasses. The first one-thousand students were also given t-shirts promoting “Coaches vs. Cancer,” which is why both teams had their coaches were wearing tennis shoes during the game. Getting in the stadium two hours early to watch Indiana warm-up was incredible; and I got my first glimpse of just how high Hanner Parea can jump (very high). 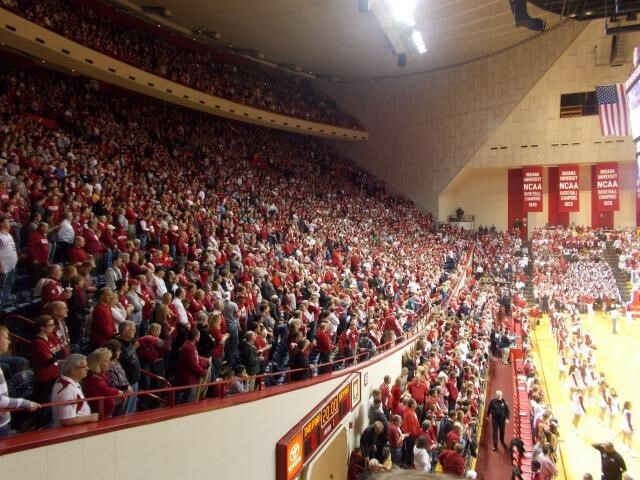 And best of all, Indiana pulled off a victory in front of their amazing home crowd. Waiting in the cold was very-well worth my five hours of waiting; I met new people, got on camera, and got to cheer on one of the nation’s best basketball teams as they took down a conference rival. All current students who are basketball fanatics and/or have access to a General Admission game should definitely partake in the waiting outside Assembly Hall. You will laugh, not cry, meet some new faces, and live a once-in-a-season experience! If you are a prospective student and are highly interested in campus life, or basketball in general, you will not find a more devoted fan base than Indiana’s when choosing a college. (Plus, it is practically standard General Admission procedures for students to wait outside on gameday at any big school.) Who knows, you may get on camera or have a person with a heater next to you. 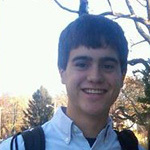 I am a current freshman at IU, majoring in Sport Marketing & Management. I love sports, movies, TV and basically anything that's awesome. Despite being born and raised in New Jersey, I am a big Chicago sports fan, which helped attract me to this university. I would like to work in the sports industry once I graduate, whether it be for journalism, production, or broadcast. I am a member of the Indiana University Sports Communication Club and have submitted multiple pieces to their student-run website. 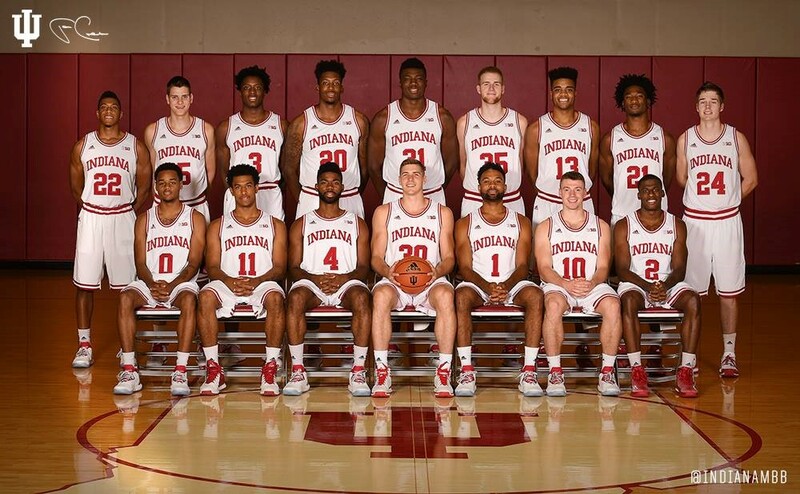 Like everyone else in Bloomington, I am a big Indiana basketball fan, and hopefully I can have the opportunity to cover one of their home games in the near future. I hope you can relate to my (somewhat opinionated) views on life and enjoy what I have to offer!